Doesn't look like a scam, you can see its LHD from the location of the brake booster. Just looks like another ratty NJ repainted accident car...just sayin. Someone help me out here. Is this a scam? The car has been listed for a while now. The seller doesn't mention if the car is RHD or not but if it is a USDM car, this is a 1 of 21 6 speed Hardtop from what I can tell. I wonder what the original color was, regardless, the grey looks alright. something didn't smell right about that djg car on eBay. removed the 97 badges because i wanted a clean body. yeah ok.
That DJG car on Ebay was my old car. It's a very clean car but it was resprayed and the passenger door VIN is missing. Title is clean and no accidents were reported. When I purchased it the owner did not know the history of the car or why it was missing a VIN. Listing is down. Did you...? yeah those guys at the dealer really know a lot about cars. Exactly. I actually believe the GSM was telling the truth. I have yet to come across a Toyota dealership employee that has a clue about VIN tag locations on our cars, made all the worst by a car that hasn't been sold new at a dealership since 1998. Thank you, PM on the way. Last edited by PasadenaTurbo; 03-25-2016 at 06:14 PM. i have sent that to sellers and they still have no clue at all. Good to know the Vin tags are in 12 different places since I had thought it was only 11. Speaking of VIN numbers, I am almost to the point that I can recite VIN numbers. If you tell me your VIN #, I can tell you what year your car is, whether it is a 6 speed, Auto or NA and if it is a Targa or Hardtop. It's a NA to TT conversion. This is why posting the VIN number during a sale is so important. I would have been able to tell it was an NA. Are you going to update the ad now that you know it has been resprayed, missing a door vin and was APU'd by a previous owner? Also, when I put the carbon hood on and removed the stock one, I was planning on keeping the hood for future use but a local supra owner needed a hood so I sold them mine. It did have the vin# on it as well. I'm not as concerned with original paint and vin's as some on here. The car was clean and I wouldn't hesitate in purchasing it. 1993 White auto NA with 48k miles for $24k. Car has black leather interior with White leather seats. It is a Hardtop with a sunroof. I hate clicking on 97% of supra ads and within 2 hours the thing is flagged by people trying to get the jump on the car or it has been removed by its author for no reason. I hate clicking on 97% of supra ads and within 2 hours the thing has been removed by its author for no reason. Car considered sold is a pretty good reason why it was deleted by author..
You have to remember that there are a plethora of people searching craigslist at all times of the day. The moment a Supra gets posted, someone sees it and tells all their friends. Word then spreads like wildfire. 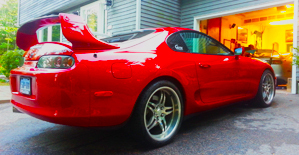 Consider the "certain color supra which will remain nameless" that sold last week. A post was made on craigslist, then someone saw it and posted a screenshot of the ad in one of the FB groups to which 60+ people saw within the first hour. I saw the ad 30 minutes after it was posted and the car had already been sold. 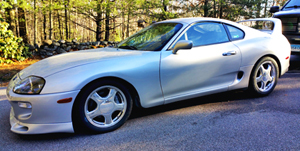 Ryan Shea is selling his black 1993 NA for $14.5k. It has 121k miles and is clean. There has been plenty of interest including offers over asking price. The only reason it hasn't sold is because he is located in Clovis, New Mexico which is about 100 miles from airports in Lubbock and Albuquerque.